A simple LDB plugin to display the current dungeon/raid difficulty settings. You can change the difficulty setting with the right-click menu. Majority of the code is "stolen" from Verissi's Difficulty. 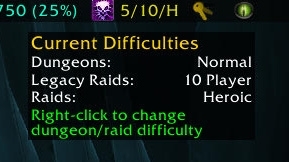 I created this addon because I wanted to improve V_Difficulty a little and to repair the freezing error at login since patch 5.3. If you have suggestions for short difficulty names, please let me know. Include NoTaint UIDropDownMenu to avoid taint issues. Added leave party/instance to the menu. Reworked selection panel to a single one. 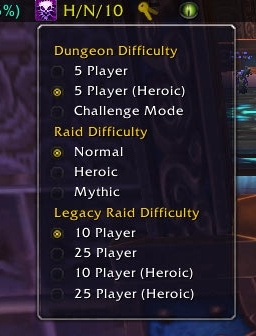 Added correct support for legacy raids. Initial release, renamed to Dungeon Difficulty. Determining which addon causing the tainting is a hard process. Please disable Dungeon Difficulty and check if error message still appears. Message: Error: AddOn DungeonDifficulty attempted to call a forbidden function (JoinBattlefield()) from a tainted execution path.